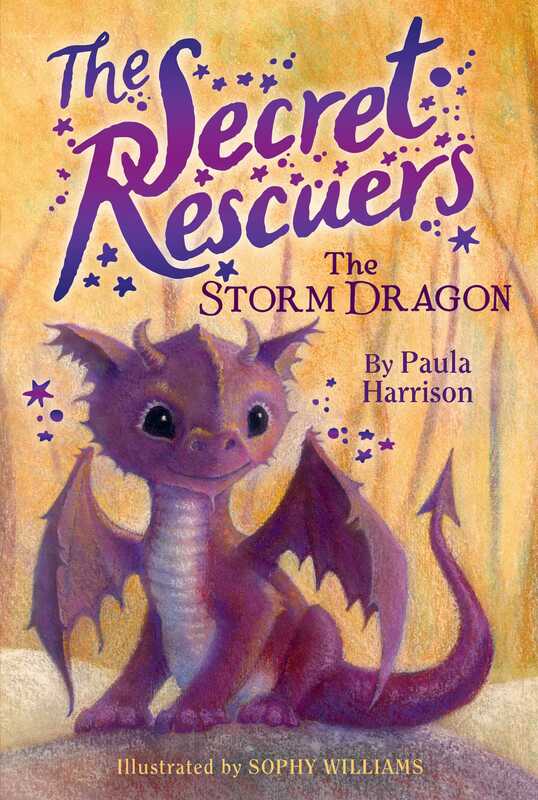 A group of friends set out to save magical creatures from a cruel queen and her wicked soldiers in the first book in the brand-new Secret Rescuers chapter book series. Sophy hurried out of the castle door carrying a heavy wooden chair. She stopped at the bottom of the steps to get her breath back. Her arms ached from lifting things all morning! A gentle breeze blew across the castle battlements, ruffling her wavy golden hair. Mrs. Ricker was the royal housekeeper. She was the kind of person who could spot untidy hair or a dirty apron from miles away! “Yes, Mrs. Ricker.” Sophy searched her apron pocket for a hair bobble and quickly braided her hair. Her parents had died when she was little, and she’d worked as a maid at Greytowers Castle ever since. She was used to the housekeeper’s strict ways. Mrs. Ricker went back inside. Sophy picked up the chair again and walked across the wooden drawbridge. The castle was circled by a moat filled with water, and the drawbridge was the only way to get across. When she reached the other side, Sophy set down the chair and gazed around. Greytowers Castle stood on a hill, and the view from the top was amazing. The Kingdom of Arramia stretched out in every direction, with its thick forests, bright rivers, and majestic, snowy mountains. Two planets hung together in the sky, a green one and a smaller purple one. Sophy loved the story of how the planets grew by magic in the air. Storytellers visiting the castle would often tell the tale, and she would hide behind the door to listen. Sometimes the storytellers would talk of magical animals such as unicorns, star wolves, cloud bears, and dragons. Then Sophy would promise herself that one day she’d leave the castle to go to look for the creatures in those stories! She shaded her eyes to peer into the distance. Beyond the fields was a huge forest that stretched for miles. Away to the west a silver river wound along the valley. Sophy had heard of many magical animals, but she’d never seen any of them. Could there be a star wolf in that forest . . . or a unicorn by that river? She was too far away to see, and it wasn’t likely the creatures would ever come closer to the castle. Not everyone was kind to magical animals, but Sophy didn’t really know why. The queen’s favorite knight, Sir Fitzroy, had once declared he thought it was wrong for creatures to have magical powers at all. Sighing, Sophy dragged the chair round the corner to the gatehouse. The ground was covered with tables, chairs, wardrobes, and boxes. Queen Viola had decided to get rid of some palace furniture, along with the old king’s belongings. King Rupert had died the year before. He’d been a great collector, so there were an awful lot of things the queen wanted to throw away! “Good. I don’t think I’d be able to fit anything else on the cart.” Tom went off, whistling. Sophy walked around the mountain of stuff. The old furniture was going to Ingleton, a nearby village, to be sold at the market. Tom, who worked in the gardens, would be taking it there in the cart. Among the worn-out chairs and tables Sophy could see the old king’s belongings. There was a pile of rolled-up maps, a huge telescope, and towers of old books with titles such as Paths Across the Heskia Mountains. It made Sophy feel sad seeing the unwanted books piled up on the ground. Then she noticed something else and gasped. On the grass, under a table, was a small black chest with a silver lock. Sophy recognized it straightaway. The king had collected crystals and kept them in that chest. She’d only seen them once, when the king had opened the box as she was passing by. She’d never forgotten the dazzling beauty of the stones inside. Surely the queen hadn’t thrown them away? Her heart thumping, she climbed over two chairs and scrambled under the table to get to the chest. Her apron was really grubby now, but she didn’t care. Her fingers struggled with the silver catch, but eventually she opened it and pulled up the lid. Crystals of every color, from ruby red to emerald green and sapphire blue, gleamed inside the box. Sophy took out a deep-blue one and held it in the palm of her hand. This was the color she’d always imagined the sea might be. A fluttering noise made her look up. A golden songbird flew down and perched on the back of a chair, watching her with beady black eyes. Sophy put the blue crystal back, suddenly feeling as if she was doing something wrong. The bird fluffed up its golden feathers and let out a trill of beautiful music. Sophy had never heard anything so lovely. She hoped the bird might sing again, but instead it fluttered down beside her. Then it hopped onto the edge of the chest and tilted its head, eyeing first Sophy and then the crystals. “They’re beautiful, aren’t they?” said Sophy. The songbird hopped right into the middle of the crystals and flapped its wings, scattering stones out of the chest and onto the ground. But the songbird went on beating its wings, sending more stones flying. At last it stopped and pecked at the remaining crystals. Sophy leaned closer. It was trying to get at something beneath the stones. The bird had a piece of purple material in its beak, and it pulled and pulled. Finally the bird let go of the cloth and gave an impatient trill. It was almost as though it was asking her to help. “What have you found?” Sophy took hold of the purple material and pulled it free of the crystals. She found herself holding a small cloth bag that had something heavy inside. The songbird fluffed its feathers again and watched expectantly. Sophy’s fingers tingled as she undid the drawstring bag and reached in. Her hand brushed against rough stone. The purse was full of small pieces of rock. She took one out and studied its lumpy, gray surface. The bird gave a final burst of song; then, without another look at the bag or at Sophy, it flew off. Sophy frowned at the rough stone. All that fuss about bumpy pieces of rock? She’d thought the songbird was trying to show her something . . . but why this? A swirl of wind lifted her hair, and a shaft of light beamed down on the stone’s rough edges. Sophy felt a strange tumbling in her stomach as if something was about to happen. “Sophy!” Mrs. Ricker’s footsteps pounded on the drawbridge. Sophy quickly crawled out from under the table. She’d lost track of the time! She dropped the little stone into the bag and put the bag in her apron pocket. Then she scooped the crystals back into the chest and climbed over the furniture. “Coming, Mrs. Ricker!” she called, rushing off toward the castle. This delightful start to a new magical animal series features black-and-white illustrations of the adorable characters throughout, which add even more life to Harrison’s characterizations of Sophy and Cloudy. A great new series to add anywhere magical animal series are popular, and perfect for readers making their way into longer chapter books. Charming black-and-white illustrations complement the story. Chapter length and vocabulary are just right for intermediate elementary readers. VERDICT A lighthearted, magical story that is sure to delight young fantasy fans.